Neptune Beach Resort is located on the Bamburi beach lined with palm trees and only approximately 14 km to the north of Mombasa centre. The resort is very popular, offering very good service and a family atmosphere. The special highlight is the newly designed garden area and the new terrace with a view of the Indian Ocean. There are many quiet areas throughout the resort to offer you calm and relaxation. The generous lobby and the impressive halls create an open air feeling leaving you with plenty of room for your very individual holiday experience. The resort also offers a wide range of excursion possibilities that include a trip to the lively city of Mombasa or an opportunity to experience the tranquillity of nature in the Tsavo East and Tsavo West or Amboseli national parks. Neptune Beach Resort offers 78 completely redecorated double, superior and deluxe rooms with house telephone, satellite TV, air conditioning, hairdryer, bathroom/shower, WC and balcony. The superior rooms have tea/coffee making facilities and sea view. 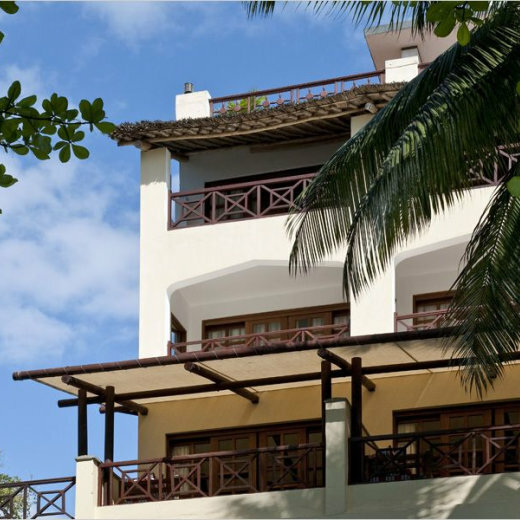 The new larger deluxe rooms in Swahili style are also equipped with mini-bar and balcony (with sea view). All rooms have a safe. The hotel’s own massage centre and beauty salon is ideal for relaxation. There is also a pool with integrated children’s pool, sunloungers and towels at the pool all inclusive. At the resort's main restaurant, you may choose from a varied selection of national and international food at different buffets. The hotel also has two bars that entice you with refreshing cocktails and cool drinks. There is also a new coffee lounge in the hotel lobby.